Books on suffering are not infrequently published. This given fact of human experience always warrants further discussion and thought, and yet most of what is written tends to focus on suffering in the theoretical, while other works suggest ways to avoid suffering. 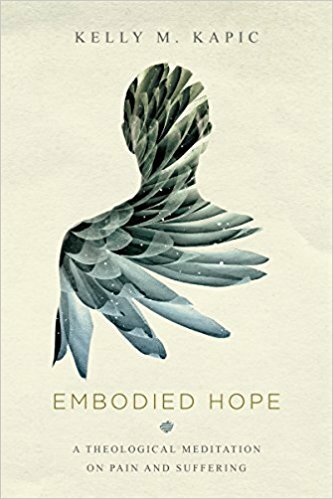 In Embodied Hope, however, theologian Kelly Kapic helps readers to encounter suffering, grieve it, and endure it in a godly way. This is a truly unique and compelling work. Kapic’s experience drives the approach of this book. Though his own story and his wife’s sets the tone, the book is not about them. In fact, beyond the introduction you hear very little else about their experience. Instead he sets a tone and seeks to help readers navigate the experience of suffering, not simply the theoretical stuff of philosophy and theology. The book is broken down into three parts: (1) The Struggle, (2) The Strangeness of God, and (3) Life Together. Each focuses on a different aspect of the personal experience of suffering. In part one, Kapic humbly directs us to speak aloud the internal struggle that we, especially believers, have as we experience sorrow. Suffering raises hard questions about God and his love and sovereignty. Kapic also reminds us that suffering doesn’t always have an obvious why, and trying to answer that question usually leads helpers to become insensitive. This is not a book on theodicy. Kapic is careful to stress that “While there is a time to carefully dissect these philosophical problems, that time is not normally with those who are suffering” (18). He encourages readers, instead, to both cultivate the practice of lament and to accept their embodiment. Both chapters four and five gave detailed discussion to areas of Christian theology that I have read little about elsewhere. Part two turns to consider the practical implications of our doctrine of God for the experience of suffering. Kapic explores the ways that God speaks to and enters into our suffering. God is both with us and for us. Kapic taps into the theological works of Athanasius and B.B. Warfield to explore the tangible value of the incarnation. He explores the dynamic relationship between our physical suffering and the cross of Christ, noting that the cross points to God’s compassion for our physical pain. Finally, Kapic draws our attention to the consequences of belief in the resurrection of Christ. Theology matters for our sorrow, and Kapic does an amazing job of illustrating this. Part three wraps up the book by directing us to the importance of community in the midst of sorrow. He offers directives, in this final portion of the book, to both sufferers and helpers. He gives insight into how community helps us endure and grow in the midst of suffering. Embodied Hope is a tremendous and unique book. I read it not simply as a counselor but as a sufferer myself. The chapter on lamentation is of such value that I think it alone is worth the price of the book. This is an area that is overlooked and underdeveloped in contemporary Christina literature. Mentions of suffering in the Christian living lit are often focused on “overcoming” and “victory,” but the Bible urges us to see the value of lament. In fact, there’s an entire book of the Bible on lamentation – though it too is often neglected. This chapter is a tremendous tool for cultivating a spiritual discipline that rarely, if ever, gets attention. Readers will be encouraged and challenged by reading this work. Kelly Kapic writes in an extremely accessible way, but does not reduce the subject to simplistic clichés. He offers meaty content here, but draws clear lines to practical living. I highly commend this book as a meditation on suffering. It is honest, hopeful, and practical.